I did a six week steak experiment where I ate nothing but Steak with a little salt. I had meant to write this blog post before now, but Keto MinneFest has been taking most of my spare time. During the first two weeks, I drank only water. No coffee was allowed. Weeks 3 and 4 I also drank caffeinated coffee. And weeks 5 and 6 I drank decaf along with my water. So first a few numbers. Over the six weeks I ate 114 pounds of steak (~ 90 lbs of ribeye, 22 lbs New York Strip and 2 lbs of porterhouse), drank over 38 gallons of water, 4 gallons of caffeinated coffee and 3.3 gallons of decaf. 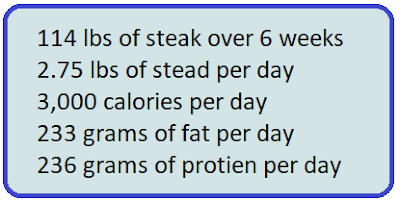 Over the six weeks I averaged 118 oz of water and 2.75 lbs of steak each day. During the coffee weeks I averaged 38 oz of coffee each day. During the decaf portion I averaged 30 oz of decaf. I averaged about 3,000 calories each day. This should have been sufficient to cause a calorie surplus.